Quinoa is the grain with High protein. The Glycemic Index is very low so suggested for Diabetes. This is gluten free, easy to cook and the beauty is can be replaced with the rice in all kinds of recipes. Small Qty of intake is sufficient in providing the same amount of energy when compared with Rice. 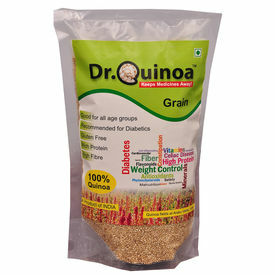 3 kg Quinoa per month per head is sufficient. It caters all the needs energy wise and hunger wise also. Releases energy slowly and sustained for longer hours. This is very good choice for slimming.